This bundle feels like it's been designed to work together and it's also very flexible. 70 Watts per speaker. Tweaking options aplenty. Yamaha's famous white cones have recently made a comeback in the form of the all-new HS series. Surprisingly, this is limited to the five-inch HS50M (on review here) and the HS80M, a much larger eight-inch design. 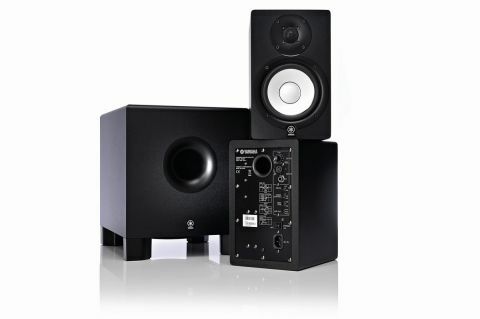 Combined with the HS10W sub, the HS50M bundle lists at £587, and is therefore the most expensive set in this review. A quick look around the back of the HS50 reveals lots of settings options, including a 2dB cut-and-boost at the critical 2kHz frequency. Overall power is 70 Watts per speaker (45 Watts LF and 25 Watts HF), and with a choice of TRS and XLR inputs and a centre-notched input sensitivity, set up should be easy. The SW10W is both the most expensive sub here, and the most compact. Around the back there are plenty of options, including adjustable low-pass for the sub and corresponding low-cut for the pass-through satellite connections. There's also phase reverse, and an additional sub split for an extra sub. There's a familiar up-front nature to this set-up, with the illuminated Yamaha logos a constant reminder of their heritage. Like the Event S100, the sub is downward facing, but with a forward reflex port and 140 Watts to play with it delivers more punch. Alas there's no footswitch bypass, and (being an eight-inch) it's not as weighty as the M-Audio sub. Even so, the overall combo is our favourite so far, and if the up-front sound becomes too much, you've got tweaking options aplenty.